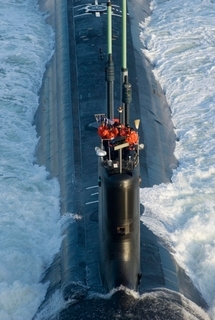 NEWPORT NEWS, Va., Dec. 14, 2007 (PRIME NEWSWIRE) -- The nation's newest and most advanced nuclear-powered submarine, North Carolina (SSN 777), returned to Northrop Grumman Corporation's (NYSE:NOC) Newport News shipyard with a broom atop its sail to signify a clean sweep of the ship's initial sea trials. Photos accompanying this release are available at: http://media.primezone.com/noc/ . Downloadable video and photos are also available at http://www.nn.northropgrumman.com/news/2007/121407.html. "We fully exercised the ship through the full range of speed to the full range of depth, and I'm pleased to report that the trials were successful," said Adm. Kirkland Donald, director of Naval Nuclear Propulsion. "It was a remarkable tribute to the people of the shipyard here at Northrop Grumman Newport News and your team members at Electric Boat. We know how to build these things. They are marvelous ships. They are exactly what the country needs -- we just need more of them, and it's time to keep building them." "We have raised the bar for Virginia class submarine performance," said Mike Petters, president of Northrop Grumman Newport News sector. "The trial that we were just on was an exceptional trial -- the best one of the class so far. All of the shipbuilders, all of the crew and all of the teammates have done a great job." North Carolina is the fourth ship of the Virginia class and is in the final stages of construction at the company's Newport News shipyard. Delivery to the Navy is scheduled for January 2008. "We had a great team build the ship and we have a great crew to match. They certainly proved that this past three days," said Cmdr. Mark Davis, prospective commanding officer of the pre-commissioning unit North Carolina. "They went to sea as a new construction crew and they came back as an operational one. They did a great job and I'm very proud of them." The keel for North Carolina was laid on May 22, 2004. The ship was christened on April 21, 2007 and launched on May 5, 2007. The commissioning will be in the spring in Wilmington, N.C. For more information about the North Carolina, please visit http://www.nn.northropgrumman.com/vcs/.